We will abbreviate the types of Texas Hold'em formations as follows: 1p – one pair; 2p – two pairs, 3k – three of a kind; st – straight; fl – flush; fh – full house; and 4k – four of a kind. By hand we mean the card configuration of the entire board (community board and your own hole cards), along with the number of your opponents in play at the moment of analysis. This holds for any poker variation. For any type of formation F , we denote by the probability of F being achieved by river by your own hand and by the probability that at least one opponent will achieve something higher than F, if you will achieve F.
For any hand and type of formation F, we call the pair the strength vector of that hand with respect to F.
For full house (fh), we have and (For computing we must consider all possible reconstitutions of the community board in the river stage, in the assumption you achieve a full house by river, then calculate the q probability for each case, and then using some probability formulas for obtaining the overall probability. 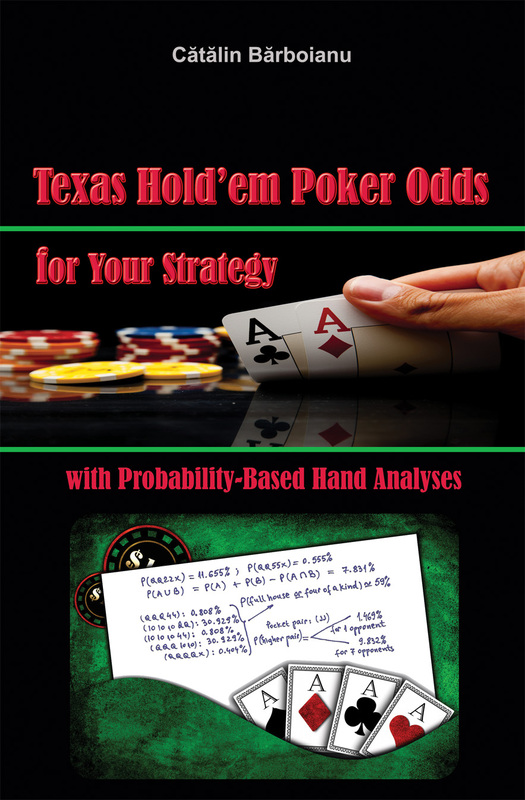 This process of calculation is described in detail in the chapter Evaluating the strength of a hand of the book Texas Hold’em Poker Odds for Your Strategy, with Probability-Based Hand Analyses). The strength vector of this hand with respect to full house is (2%, 41%) and reads as follows: You have about 2% chance for achieving a full house by river; in case you do achieve it, your opponents have about 41% chance of beating it. Definitely, it is a weak hand with respect to full house: only 2% chance of achieving it and then 41% chance of loosing (59% of winning) with it. Thus, you might consider other inferior formations to analyze. If is the strength vector of a hand with respect to F, we call the number the strength indicator of that hand with respect to F.
In our previous example, the strength indicator of the hand with respect to full house is . is also a probability, namely the probability that you will achieve a formation of type F by river and none of your opponents will achieve something higher, if you achieve it. If we were to consider all types of formations (from one pair to four of a kind) and do the same calculations for each of them, we would end up with seven strength vectors, one for each type of formation. These seven vectors would give us the whole image of the strength of that hand. In fact, they form a 2 x 7 matrix of probabilities. For each hand, we call the matrix the strength matrix of that hand. On the first row of the strength matrix are the probabilities of the own hand achieving the various types of formations by river. On the second row are the corresponding probabilities that your opponents (at least one) will achieve something higher than you by river, if you will achieve that expected type of formation. Each column corresponds to a type of formation (1p, 2p, 3k, s, fl, fh, 4k). Each hand has an unique associated strength matrix, whose elements are calculable manually or by software program. - Straight flush has not been included on the last column as the highest type of formation. In fact, it is included in the flush type. When you hit a straight flush, there is nothing to analyze - you should put all in. - We replace by 0 the elements of any column of a type of formation that is included at the moment of analysis or will be included – should it occur – by river in a superior type of formation. By this convention, the ignored type of formation F gets a null probability of being achieved and consequently a null probability for the opponents to beat it if it occurs . Thus, it practically comes out of the hand analysis. For instance, the strength matrix associated to a hand in turn stage where you have a full house, has the form . In this case, one pair, two pairs, and three of a kind cannot be achieved as the full house includes and cancels them, and straight is impossible since you have at maximum two cards of it. Thus full house and four of a kind remain to be dealt with. Interpretation. As the strength of a poker hand can only be expressed through mathematical probabilities of final events, the strength matrix is the most adequate object to picture such strength. When we evaluate the strength of a hand by interpreting its strength matrix, we actually assume a scale on which to place that strength, and implicitly a relation order over all possible hands. This is what “how strong is it” means in mathematical terms. Assuming we have the strength matrix of a hand we want to analyze, how will we actually interpret it? The rough rule is: The higher the p-probabilities and the lower the q-probabilities, the stronger the hand. However, if we consider the p row, it is better for the p-probabilities to be higher in the second part than in the first, as the second part corresponds to the most valuable achievements. In fact, a high value of a p-probability for only one type of formation of the second part (s, fl, fh, or 4k) may be sufficient for considering the hand strong enough for aggressive raising, as example. Having high values of the p-probabilities in the first part (for 1p, 2p, or 3k) is not a positive factor in the hand’s strength, since consequently we will have lower values in the second part, which means that the most valuable formations are unlikely to be achieved. This happens because the sum of the p-probabilities has an upper bound. The strength matrix cannot be interpreted only by the p-row. The q-probabilities are also important, as they can raise or temper the trust one may have in the corresponding p-probabilities with respect to the outcome of the decision made basing on them. Of course, for a complete analysis, the entire matrix (all strength vectors) should be evaluated and interpreted. That is because when a strength vector shows non-favorable probabilities, one may look for alternatives among the other types of formations and these other strengths have a cumulative effect toward that hand’s strength evaluation. You achieved three of a kind and straight. Looking only in the straight column, for a straight achieved and only 11% chances of your opponents having something higher, one may consider this hand strong enough to put all in. The strength indicator. There exists a way of aggregating the data of a strength matrix in order for the strength to be interpreted through a single value as indicator and not through 14 values. Since every type of formation counts differently in what we call the strength of the hand expressed through probability (the unit strength of two pairs must weight less than the unit strength of a straight, for instance; that is, roughly speaking, that 1% chances of achieving two pairs weights less than 1% chances of achieving a straight), this indicator must be a weighted mean of the strength indicators of the hand with respect to each type of formation. For any hand, we call the number , where the weights are predefined in the next table, the strength indicator of that hand. The weights that show in the weight column are the normalized values of the inverses of the probabilities of the types of formations occurring in a random 7-card draw. In the previous example, the strength indicator is . Other may refer to the strength of a poker hand in various ways, from which the mostly used are statistical. In their view, a hand is strong depending upon how often it has won in the past, when and where it occurred. In statistical terms, they assign the quality of being weak or strong in various degrees to a hand referring to relative frequency instead of probability, while this latter is a limit of relative frequencies and stands as the most objective measure of possibility and degree of belief in the occurrence of an event. All kinds of software called “poker odds calculator” help them in making this assignment. Read our article Returning the Odds: Partial simulations vs. compact formulas to see how the results from such software differ from the mathematical probabilities and implicitly from the strength indicator defined above. Probability-based reduced hand analyses. For a given concrete hand, completing its strength matrix by manual calculations is a laborious job. With regard to the practical analysis of the hands, many times we should focus only on a portion of the types of formations expected to be achieved, sometimes only on one type of formation. This reduction may due to either the particular configuration of the board, which makes impossible the achievement of other types of formations, or the relevance of the obtained information with respect to the threshold of afforded risk. If you run such a reduced analysis, in fact you partially complete the strength matrix of that hand. There are reductions and approximations for the probability calculations applied in Hold’em and these can be also applied to the evaluations of the strength of a hand. As the strength matrix of a hand gives an image more relevant to what that hand can offer to its owner than the strength indicator, a reduced hand analysis would mean the interpretation of the partially completed strength matrix. Of course, the parts of that matrix to be computed and interpreted should be chosen by combined criteria of relevance and ease of calculations. Analysis of particular hands may not even require reference to their strength matrices, but can be run directly on those particular card configurations, by using all the reduction methods available. Click here for some probability-based reduced analyses of concrete Hold'em hands.